National Monument or popularly abbreviated with Monas monument or memorial is at 132 meters (433 feet), which was established to commemorate the resistance and struggle of the people of Indonesia to win independence from the colonial Dutch East Indies. Construction of the monument began on August 17, 1961 under the direction of President Sukarno, and was opened to the public on July 12, 1975. This monument was crowned flame sheet coated gold symbolizes the fighting spirit burning. National Monument is located right in the center of Merdeka Square, Central Jakarta. Monument and the museum is open every day from 8:00 to 15:00 pm. On Monday last week of the month is closed to the public. Once the seat of government of the Republic of Indonesia returned to Jakarta after previously based in Yogyakarta in 1950 following the recognition of the sovereignty of the Republic of Indonesia by the Dutch government in 1949, President Sukarno began to think about the construction of a national monument that is equivalent to the Eiffel Tower on the ground right in front of the Presidential Palace. Development aims Monas monument commemorate and preserve the Indonesian struggle for independence during the revolution of 1945, to continue to inspire patriotism and spirit of the present and future generations. On August 17, 1954 a national committee was formed and a national monument design competition held in 1955. There are 51 works were entered, but only one works made by Frederich Silaban that meet specified criteria committee, among others, illustrate the character of the Indonesian nation and can last for centuries. The second competition was held in 1960, but again none of the 136 participants who meet the criteria. Chairman of the jury then asked Silaban to show his design to Sukarno. 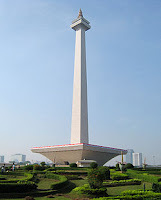 However, Sukarno does not like the design of it, and he wanted the monument was shaped phallus and yoni. Silaban then asked to design a monument with a theme like that, but the design of the proposed Silaban so great that the cost is very large and can not be borne by the state budget, especially when economic conditions were bad enough. Silaban refused designing smaller building, and suggested the construction be delayed until the Indonesian economy improved. Sukarno then asked the architect R.M. Soedarsono to continue the design. Soedarsono enter the numbers 17, 8 and 45, August 17, 1945 symbolizes the start of the Proclamation of Independence of Indonesia, into the design of the monument. National Memorial was later built in the area of ​​80 hectares. This monument diarsiteki by Friedrich Silaban and R. M. Soedarsono, broke ground August 17, 1961.